This web site on Cecilia A. (née Schlee) Heilbach is under development. We welcome your input, stories, photographs, documents, and other resources. According to the Social Security Death Index, Cecilia Schlee was born on September 20, 1900. She was baptized on September 23, 1900, by Father August Fricker of Saint Boniface R.C. Church, 124 Locust Street, Buffalo, New York. 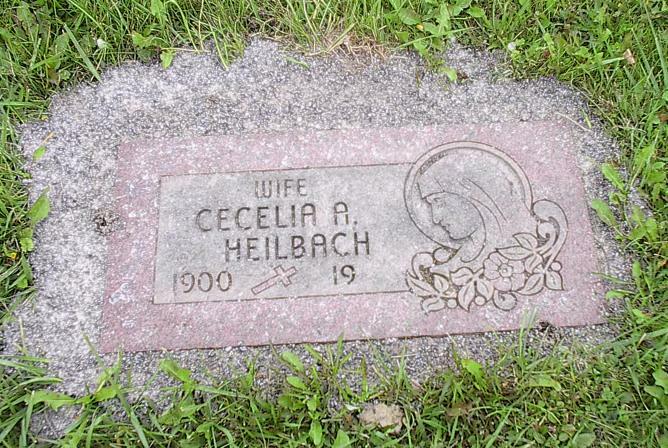 Cecilia married William E. Heilbach, who was born in 1899. William died on January 13, 1964. Cecilia died on December 11, 1969. At the time of her death, she resided at 152 Grandview Avenue in Buffalo. 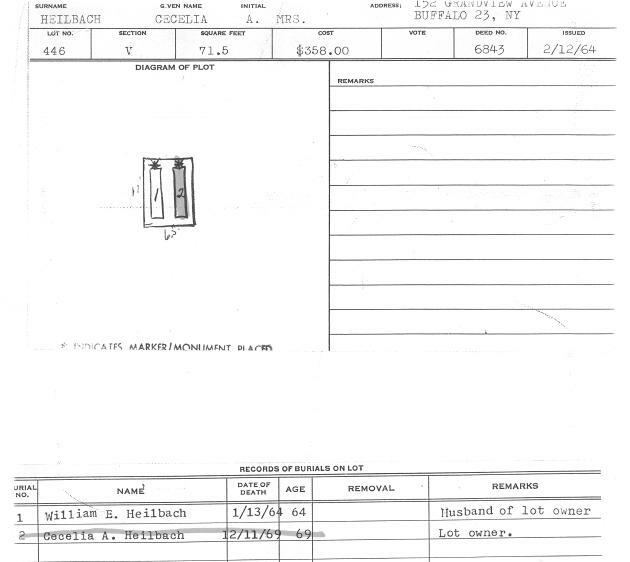 Both William and Cecilia are interred in Lot 446, Section V, Mount Calvary Cemetery (Pine Hill), Cheektowaga, NY. 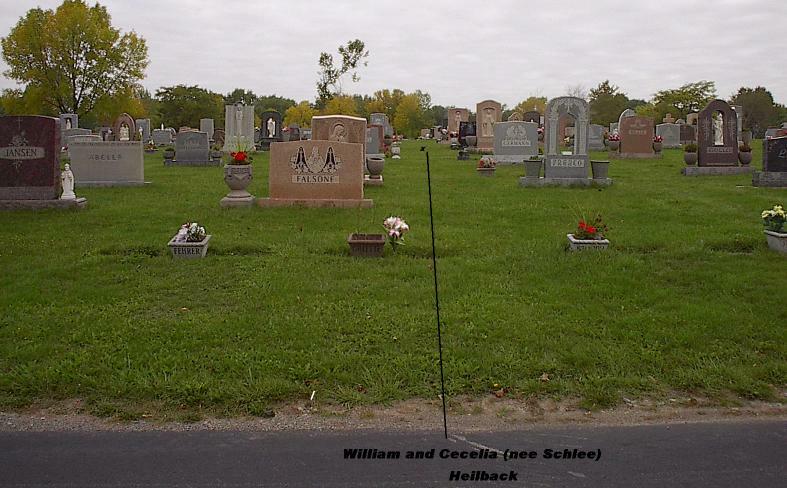 General location of the gravesite of Cecilia (née Schlee) and William E. Heilbach, Lot 446, Section V, Mount Calvary Cemetery (Pine Hill), Cheektowaga, NY. 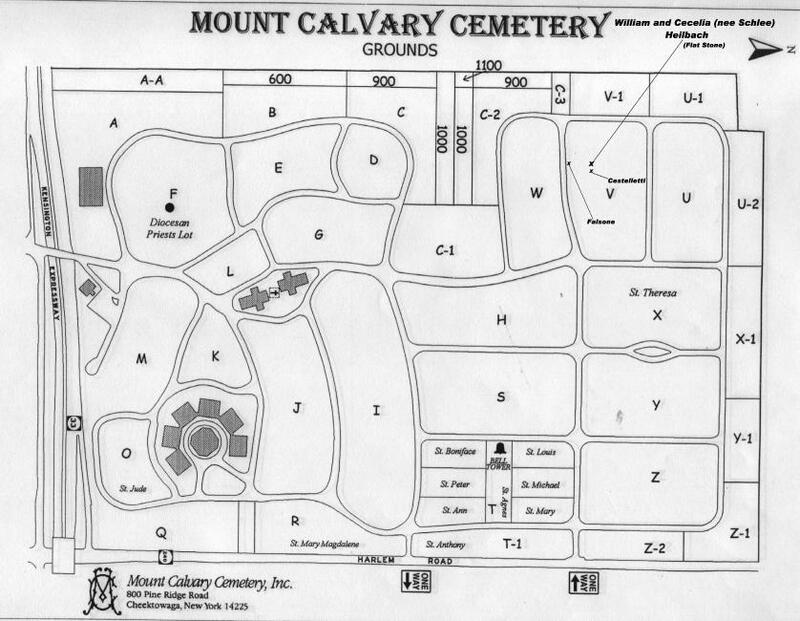 A map to locate these cemetery plots is available here. 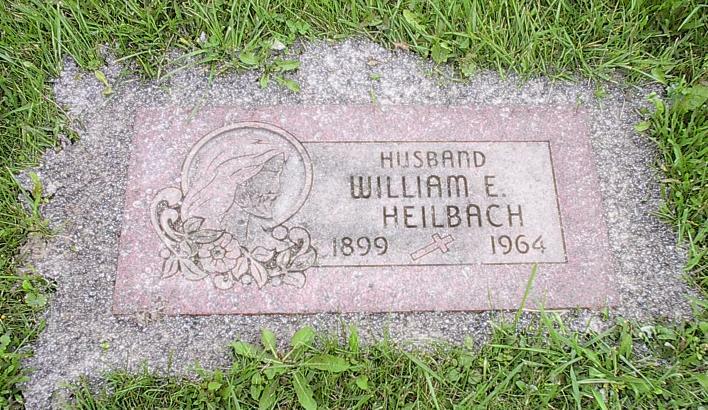 Grave of William E. Heilbach, Lot 446, Section V, Mount Calvary Cemetery (Pine Hill), Cheektowaga, NY. Grave of Cecilia (née Schlee) Heilbach, Lot 446, Section V, Mount Calvary Cemetery (Pine Hill), Cheektowaga, NY. Baptismal Record: Cecilia Ann Schlia, daughter of Frances (née Schwert) and August Schlia (Schlee). Born on September 20, 1900. Baptized on September 23, 1900, by Fr. August Fricker, Saint Boniface R.C. Church, 124 Locust Street, Buffalo, NY. Sponsors were John and Mary Schlia. 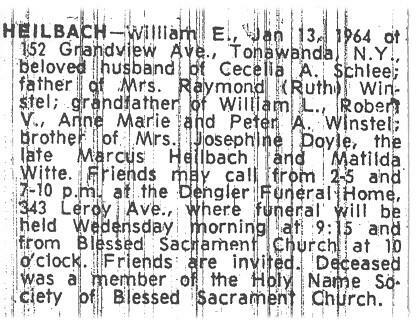 Obituary: William E. Heilbach, died January 13, 1964. 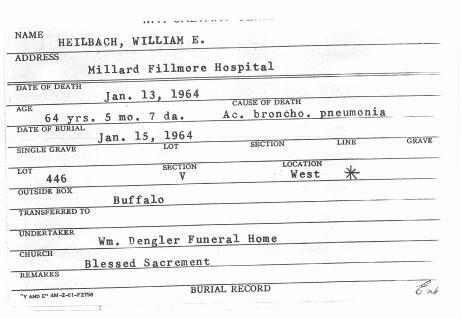 Interment Record: William E. Heilbach; died January 13, 1964; interred in Lot 446, Section V, Mount Calvary Cemetery (Pine Hill), Cheektowaga, NY. 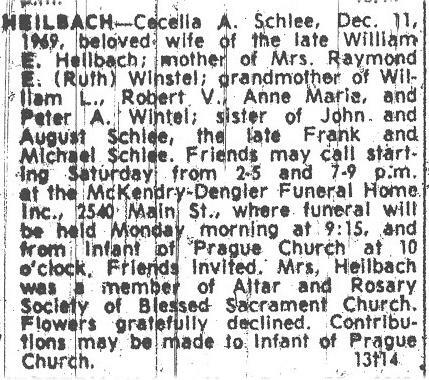 Obituary: Cecilia (née Schlee) Heilbach, died December 11, 1969. Social Security Death Record: Cecilia (née Schlee) Heilbach, born September 20, 1900; died December, 1969. 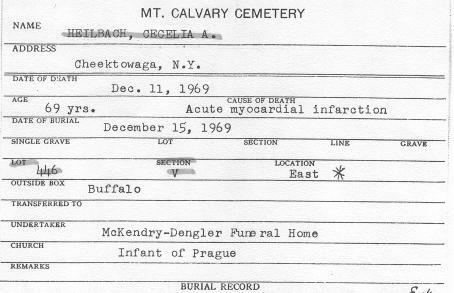 Interment Record: Cecilia (née Schlee) Heilbach; died December 11, 1969; interred in Lot 446, Section V, Mount Calvary Cemetery (Pine Hill), Cheektowaga, NY. Cemetery Plot Record: William E. and Cecilia (née Schlee) Heilbach, interred in Lot 446, Section V, Mount Calvary Cemetery (Pine Hill), Cheektowaga, NY.